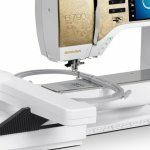 Increase your knowledge and skills on your BERNINA 7 & 8 Series Embroidery Machine. Requirements: Bring your BERNINA 7 & 8 Series Sewing Machine, Embroidery Module with Hoops and all Accessories. You will need thread and scissors. The class workbook is available for purchase in hard copy. If you would like the workbook on a thumb drive, we will do that free of charge. You can bring a thumb drive from home or purchase one in the shop.